This Soul-Exciting Ensemble of Prepossessing Blossoms is a suiting token for transmitting to your MR Perfect your sincere and soothing sentiments for him and to thus secure a nice niche in his heart. This Composition features Variant magical Blossoms such as 3 Red Roses, 3 Pink Roses, 2 Pink Gerberas and 3 Pink Lilies sequenced in a neat Glass Vase. This Soul-Exciting Ensemble of Prepossessing Blossoms is a suiting token for transmitting to your MR Perfect your sincere and soothing sentiments for him and to thus secure a nice niche in his heart. 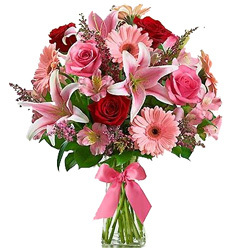 This Composition features Variant magical Blossoms such as 3 Red Roses, 3 Pink Roses, 2 Pink Gerberas and 3 Pink Lilies sequenced in a neat Glass Vase with Small Cadbury Celebration. Send this Mind-Gripping Medley of Mesmerizing Flowers to the most valued one of your life and glut the person�s mind solely with magnified earnestness. Diversified enchanting Flowers�that is to say Pink Gerberas (2), Pink Lilies (3), Red Roses (3) and Pink Roses (3) arranged in a nifty Glass Vase make up this Medley with 4 pcs Ferrero Rocher. This Soul-Exciting Ensemble of Prepossessing Blossoms is a suiting token for transmitting to your MR Perfect your sincere and soothing sentiments for him and to thus secure a nice niche in his heart. This Composition features Variant magical Blossoms such as 3 Red Roses, 3 Pink Roses, 2 Pink Gerberas and 3 Pink Lilies sequenced in a neat Glass Vase with 1/2 kg Chocolate Cake.